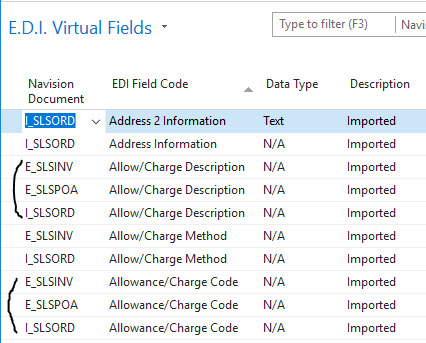 I'm working with Lanham EDI in #NAV2013R2 and I'm trying to capture the ITD12 (Payment Terms Description) from an inbound EDI 850 (PO) on an EDI In field and send it back on an EDI 855 (PO Acknowledgment). I'll also have to do this with an EDI810 (invoice). Once a sales order is created, I can see the value received in the EDI In "Description" field that I mapped, but it does not get sent out on the EDI 855. Do you see the EDI document number in the EDI FastTab of the NAV Order document (so it knows which EDI document has the associated EDI IN Description for that order)? ​Hi Brad, Thanks for responding. Is that the EDI tab of the sales order? ​Hi, Lewis. Do you have the EDI In - Description mapped anywhere else in the 850 document? 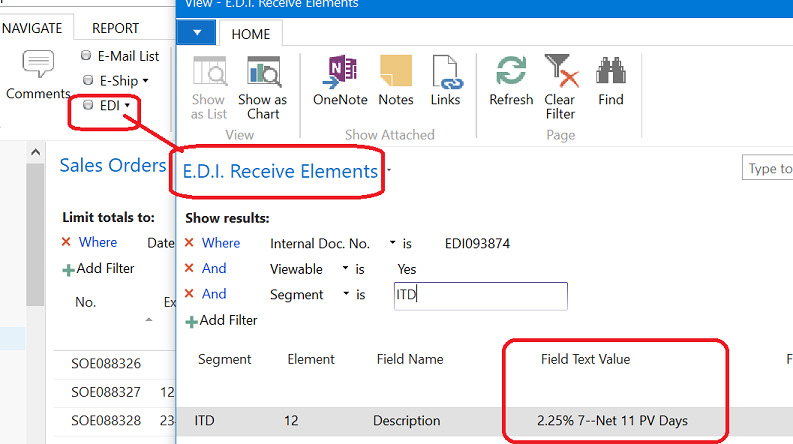 If you are using that EDI In in another Segment and the 850 does not have data in that element, or the element is not being sent, it will blank out the previous EDI In data. You can also try mapping a second Conditional to the Navision-E.D.I. Receive Doc. Hdr. Info. table, to one of the Text Fields. This should hold the data if the EDI In is just being finicky. Just a wild guess, but there are a lot of "Description" fields. Sometimes weird stuff happens. ​Thanks @Ruthie Moshos and @Ted Johnston. I will try creating a new EDI In field with a unique name and report back. ​Thanks @Ruthie Moshos and @Ted Johnston. That was it! I think from now on, I'll always create a new and unique EDI IN field for everything that requires it. EDI IN are great for this, but Payment Terms you can also use General Cross-Ref and then on the outgoing Docs setup a Reverse Cross-Ref. Doing Payment terms this way allows you to Map what terms they send on the PO to the Sales Order, and if they are changed from what they sent the outgoing documents will reflect the changes. It also makes it so the Payment Terms works if the Customer sends in a NON-EDI Order. ​When ever I reference an EDI IN field on an out going document I try to select the corresponding EDI IN field. It seems like Lanham will create multiple fields. Try selecting a different Description fld from your EDI IN Table. I've experienced losing the connection to my EDI IN fields when manual changes have been made to the PO once its in Navision. Is it possible this might be happening to your PO's? I second giving the General Cross Reference a try in scenarios like this. It was added in SE0.55 and can be used for inbound and outbound (reverse lookup) cross referencing for many tricky fields like this. It can also be used for setting Carrier and Service, Shipment Method, Tax Jurisdictions, etc. They continue to add to the cross reference options.